The NEKTON-CAT range was developed to cover the needs of cats in dietary supplements of vitamins, minerals and other essential nutrients. 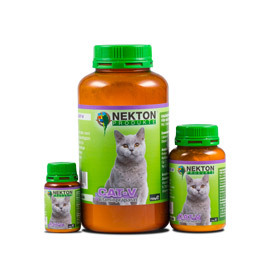 NEKTON-CAT-H contains essential vitamins blended to meet the requirements of a cat’s organism but the biotin content has been increased to enable a cat owner to help his cat get over deficiency defects. Biotin functions primarily as a coenzyme in many metabolic processes and is responsible for normal growth, proper utilization of the nutrients and correct propagation. In particular biotin ensures healthy skin and fur. The CAT-H product is especially intended to help in cases of skin and fur defects due to a biotin deficiency. Cats need vitamins, but scientific findings showed us at NEKTON that there are certain other substances particularly important to cats. Taurine, an amino sulphonic acid, has been added to NEKTON-CAT-H as an inadequate supply of this substance can lead to degeneration of the eye retina and serious eye illnesses in cats. Arginine is an essential amino acid and a vital factor in the urea cycle. Cats of all ages need a large dietary supply of arginine. If it is missing the amount of ammonia in the blood rises to intolerable levels. Too much ammonia can cause increased salivation, sickness, tremors, unconsciousness and even death within a very short time. 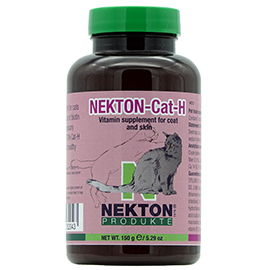 NEKTON-CAT-H provides a cat owner with a special-purpose supplement for healthy skin and shiny fur. A pet food supplement containing not only all the mineral elements a cat’s organism needs but essential vitamins too. There are many reasons why a cat owner has to have a means of supplementing his pet’s diet with essential inorganic and organic compounds. Cats, for example, are unable to form retinol (vitamin A) from the provitamin ß-carotene. In addition, vitamins are often destroyed or rendered ineffective when exposed to air, light or heat. or the vitamins in food lose their effectiveness through time. One of the vitamins vital to cats is vitamin B1. Quite often cat owners think their pet has been poisoned as deficiency symptoms are loss of appetite and apathy at first and later cramp and vomiting. Our combined vitamin and mineral supplement NEKTON-CAT-VM should be given daily to moist protein-rich cat food to maintain a pet’s health under general conditions. 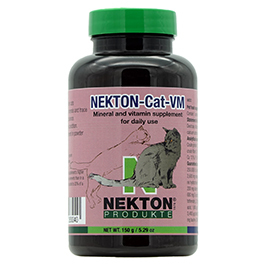 NEKTON-CAT-VM provides caring cat owners with a dietary supplement to ensure healthy, happy pets. Given regularly cats will reward their owners with lively affection and beautiful fur. NEKTON-CAT-V is a pet food supplement for cats. It contains the entire range of vitamins a cat’s organism needs in times of duress in a well balanced formula. In addition the essential amino acids Arginine and Taurine have been added to cover a cat’s special nutritional needs. Cats have unique nutrient requirements that in the wild would be covered by them eating their prey completely, including organs and contents of the stomach. Their diet as companion animals may therefore have to be completed by adding supplements. This is particularly important in times of stress. During shows, transport, acclimation, gestation, lactation, illness and medical treatment a cat’s health becomes increasingly dependent on a complete supply of all the valuable nutrients it needs. A particular stress situation for cats is when they are ill. There is an increase in vitamin requirements at this time to help the animal through the illness, and if they are treated with antibiotics or sulphonamides the need is even greater, as these substances prevent the absorption of vitamins from the intestinal flora. NEKTON-CAT-V’s formula has been developed with just such situations in mind. The high proportion of vitamins ensures coverage of the increased requirements and supports smooth functioning of the metabolic processes.